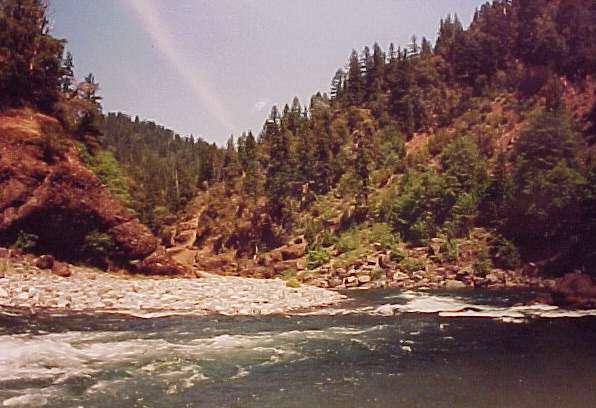 The Biscuit Complex Fire of 2002 burned the Kalmiopsis Wilderness, all of it and more. The fire burned 500,000 acres. The largest fire in Oregon's history. I traveled into the area in January. I returned in February and traveled from Oak Flat at the north end of the wilderness to Silver Creek near the middle. The scenery was unbelievable. I saw holes in the ground where giant trees once stood. Cavities in the earth from great root systems extracted by fire. Some with multiple holes, that reached down twenty to thirty feet or more. Holes that were clean, hard red dirt fired to pottery bisque that left an indelible image. I traveled on a trail that was littered with rock debris, the grasses and brush burned away let the winter rains wash stones of all sizes to the trail. My steps were stretched and chopped to accommodate the varied foot falls. It was more exhausting than just the normal effort of navigating the trail. I heard few birds, and saw none. I witnessed no other sign on the trail, devoid of deer, or any other small animal life. It was bleak, cold and very quiet except for moans of some still standing dead trees. The Franz Ranch was burned, all except the horse barn. It must have been splashed by a helicopter's dump of water. Everything around it burnt. It had been raining vary hard for days and I made this trip in the rain because it was the time slot available to me. I had hoped for a break in the weather. I did not get it, the weather got even more intense. I took refuge in the horse barn. The roof was a comfort. I traveled through the storm, with rain gear, poncho, and rain shield on my pack. I made it to Silver Creek. A bridge crosses this creek. 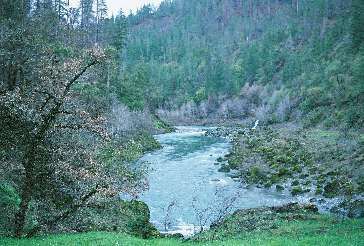 It is a fairly substantial creek and in some places it would be considered a river. The bridge was some seventy feet across and some seven feet wide. Wide enough for horses that travel the trail to cross and not get too skittish. When I saw the bridge I gasped, it was burned away. The deck was gone, only the steel girders spanned the creek. Eight inches of steel I-beams lay two feet apart crossing the creek. I needed to cross the creek to go on, or turn around. Rock cliffs, raging Illinois River and Flood stage Silver creek gave me only the two options. I went to the girder and put my left foot on it, the water raced below only two feet or so, a swirling torrent of green and white foam. I stood for some time. The wind was blowing down the canyon about 40-50 miles an hour. The storm was the worse in 20 years or more. I was in the middle of it and it was to get more intense that night. I tried to move my right foot in front of my left but my leg would not move. I focused on the steel, I picked the girder second from the outside on the right. I kept getting dizzy, some kind of vertigo. The swirling green and white water so close to the girders made my head spin. I stepped back. I had my poncho on. I had to tie it with a length of parachute cord around my waist to keep it from blowing so I could see my feet. I had my pack on with hip belt and sternum strap fixed. If I fell I would not be able to get to the buckles. I recomposed myself, I put my left foot again on the girder. I tried again to move my right leg around and found I could not. I stood for some ten minutes trying to focus only on the steel. I pushed my left leg forward and drug my right leg onto the girder. With slow and deliberate movements I inched my way across the steel. On the other side I felt a great relief. I looked back to where I started and my dog Josie was looking at me with disbelief in her eyes. I squatted down and slapped the girder I just crossed a signal for her to cross. She turned her back to me. I called her, and she cried. I slapped the girder again and said “come“. She walked back and forth and then picked the outside girder on the downstream side of what was left of the bridge. She stepped out onto the steel and crouched down, visibly lowering herself. She never faltered. She reminded me of Rin Tin Tin crawling from one foxhole to another. Now I am dating myself. It was something to see. You can see the steel girders. At flood stage the water was just below them by 2 feet.. This trip did not afford a Kodak moment. A closer look. I did not remember the wood on top of the steel. We now pushed up a rock cliff, with a very steep narrow trail. There was a mud slide and it was probably more dangerous than the bridge. I kick stomped a path up and over the mud, all the while waiting for it to let go. Silver creek is a great place with a great view. I made camp and prepared for the storm to get stronger. I was not prepared enough and it did get a great deal stronger. So this storm blew and rained till we were soaked. Tents, clothing and sleeping bag. Wet is not good. Silk, polypropylene are the answer to wet weather. My clothing dried. The sleeping bag was synthetic, and it did very well, it never dried until I got out of the rain but it stayed quite warm. I gave up on my quest to check on several things I wanted to on this trip. The rain lasted several more days and I had enough. So it was 5 days in the rain. It was interesting. A lesson in how to stay dry. I returned in June to see how things were. No rain. Josephine (my dog) and I went in on 1161 near china hat. Up to Bald Mountain, then to Polar Spring. From Polar Spring to South Bend Mountain on 1174, then down the Pups Way to Collier Bar. From Colliers Bar to Silver Creek. From Silver Creek to Polar Spring and Back to Bald Mountain and out. Now for the Bad news. Mostly burned. Areas of total devastation. Some small fingers of untouched woods. Some sections of under story burned clean and the tree tops are green and pretty. The areas that look like that are quit nice. I had some thoughts about berries. So in the woods here in Oregon it goes like this: Black, Blue or Purple, always. Red, sometimes. Never white. That is you can eat berries that are Black or Blue or Purple anytime and they are not poisonous. Red berries you must know. Raspberries, Strawberries, Thimble berries and others that you know are edible. But if you don't know the red berry don't eat it, some red berries are poisonous. White is never, which needs no other explanation. So when I see a black or dark colored berry I try it, It may not taste sweet or juicy but I know it will not hurt me... I like to eat berries. Salal and Huckle berries are my favorite ones. Rose hips, Elderberries also very good. I like to eat them so much, that I plan trips on certain trails at the best times so I can indulge myself. And I do, blue mouth and hands. Um ha um oh um, that is the sound of a hiker on a blueberry trail. Counting my steps I hike along. Most of the time I get lost between 40 and 80 and end up counting over again. I can not seem to keep my place or attention on the count. After 50 years of this behavior I know a few things. I know it takes me 233 steps to make a tenth of a mile. I can walk 1.5 to 2.5 miles an hour for ten or twelve hours at a time with 60 pounds on my back. Up hill down hill it is about the same. When daylight fades and the bats start to fly, I enjoy the cooler air and get ready for a nights sleep. I look up at the stars and the Milky Way, that band of wispy light, the galaxy on edge and marvel. I see satellites some times ten or more be for I fall into rapture. I see with my eye light that is 30, 000 years old. I feel small. I consider how insignificant I am and how arrogant I my conduct is most of the time. It is difficult not to be overwhelmed under such a display of such great magnitude and duration. Yet I find encouragement in the sight. I vow to try to make difference, in the so very short time I have. To do the best I can, with the gift of life, and not squander it. To be happy that I am here and I know it. August 9th, 2003, Day One. On the Rouge River trail 1160 from Grave creek to Agnes. But first I must get to Marial. My goal is to go to Agnes and then up the Illinois River to Collier's Bar and from there up the Pups Way to South Bend Mountain and then to Polar Spring and then out Bald Mountain Trail 1161 to the trail head near Chinaman Hat. That is the plan. But for now I am on Rouge River Trail and it is in the 80’s. My pack is about 71 lbs. I have 12 days worth of food for the dog and myself. Josephine has a pack but I can't seem to force my self to force her to carry 6 lbs of dog food. I must train her with it before I expect her to use it. Nice trail a bit up and down at times, I hate to give up elevation just to go back up again in another half mile. I blistered my feet. I have new boots but I forgot that they were new since I have had them about a year. So the others wore out and it was time for these. I put them on with out a thought. They are about a half size bigger than they should be. I had my wicking socks on and my wool socks. I had gelatin heel cups. But the 13.6 miles the first day did in my feet. I had a blister in front of the ball of my foot just back of the big toe, on both feet. I had a blister dead center of the heel. By the end of the day they were done in. I should have taken care of them sooner but I was pushing to get to a good camp spot. A campsite with good water is what I wanted, not the rouge river. Also I wanted place to put up an antenna for 80 meters. That kept me at it longer than I wanted. I made it to Telephone Hole Riffle on the Rouge, but really a bit farther Meadow Creek on the trail. I was disappointed with the lack of berries. I made camp and set up the antenna. Worked on the blisters, I broke them to let the water out. I put bag balm on them and cover with a piece of paper towel and duct tape. First Aid. I fix dinner call home on 80 meters SSB and go to bed. August 10, 2003 Day Two. I brake camp and get on the way at 7:30 am. Along the way there are many little creeks and springs. I am not packing water. I see the rafters in the river but they don't see me, they do not bother to look up just down stream. My feet are sore and I can only go about two hours before I have to stop and soak them in cold water, that seems to help for a while. I am carrying one pound of food a day for myself. And half a pound for Joesie. I also have five pounds of radio gear. I am hoping to make six miles today because of my feet. The blisters are the size of quarters. Every step is pain full. So with some difficulty I make Marial and see that there is no place for me and the dog and the antenna. Historical site called the Rouge Ranch is here. Very nice but I did not go inside, dog and too tired. Kept moving. It was not clear of where the trail was, some part of it is on a gravel road for about a mile and some. It was confusing. I pushed on. Found the trial head again and was happy to be off the road. Traveled down a piece of ground that made the trip worth the effort. The “Narrows” great trial in the rock. This piece of ground is very nice. I liked it very much. I pushed on to find a spot to stop. Finally I came to Burns Creek and camped there. Some two hundred yards down the trail is Blossom Bar and I will camp there next time I travel this way. Blossom Bar is a much nicer place to camp and better night sky. There was a lot of mining stuff all around, big piece of iron works and the like. Some black berries. Made camp and was glad to have the day done. August 11, 2003 Day Three. Went from Blossom Bar to Illahe and then on down to Foster Creek. That is the 32 mile mark on the river and 41 miles from Grave creek to Foster Creek in three days. Not to bad 13.6 for day one, 17.5 day two, and 18 for this third day. Passed through Paradise Resort and some other places on the river they call lodges. Did not look like the places that I wanted to stay, or would have liked me too. Struggled all day with my feet. The road between Foster Bar and Agness was under construction and there were big trucks and graders and water trucks and the like going back and forth. The trail here goes on the road for 11 miles and with the dog it was too dangerous for us both. I met a man named Gene from Alaska on the trail about a mile from Foster bar and he offered a ride to Oak Flat on the other side of the road construction, I said “Thank you”. It was about 6:00 pm and it had been a long day. I got to Oak Flat about 6:45 and I had a sked with Karen for 7:00 pm so I set the pack down and put up the antenna right away. I made the contact and then had my dinner. Made camp and went to sleep. The trip across the bridge was a breeze compared to the crossing in the storm. Josie and I sailed across knowing if we fell in we would not be swept away. Made it to Silver Creek about 2:00 and made camp. Took a bath and washed clothes. I have to go down over a cliff to get to the river to bathe. Took all for washing. Removed my clothes and shoes and could not move. Could not get my feet to take the pressure of the sands or gravel of the shore line. I had to crawl on my hands and knees into the river to take a bathe. It was worth it, it felt so good and I smelled a lot better. Had to crawl out to get to my shoes. I will rest here tomorrow and read my book. I rested mostly. I also worked on the trail. A large mud slide on the west side of Silver Creek made travel up the trail dangerous and difficult. I worked on this spot for a few hours to make it a bit less difficult. I would have like to done more but my feet hurt some and I was to stay off of them. I had a small infection now and washed and cleaned my feet applied the bag balm and hoped for the best. Sat and read my book. Took a bath again and swam in the river for some time. Day dreamed and slept. All in all it was a very good day. there was a mud slide. A big one took most of the trail away. Down trees and big rocks. I had to saw my way through the trees with had saw and claw my way up the cliff. Josie does it so easily. Got to Camp in 3.5 hours that is about an hour longer than it should have taken. But with trees, mud and feet for obstacles, not to bad. I like this place. I camp at the junction of 1182 and 1174. I camp in the meadow. I don't know why I like it so much, except it is a place that makes me feel good. I feel like I am home or belong there. I got the solar panel out and charged the battery for the radio. Made camp. Went and got water. Took a bath. Rested the rest of the day. I will stay here tomorrow. August 16, 2003 Day Eight. I will go up 1174 the Pups Way. It is a fast assault on South Bend Mountain. It climbs over 3000 feet in 4 miles. So here I am with feet that could be better and some 60 lb. now ready to go up. There is now flat, just up. I took only one quart of water. I drank my fill at the creek. I hope things would be good at a spring I dug out last year and or a Pups Spring. I did trail maintenance as I went. Had to drop my pack several times to do the work. The trial needs more work. The spring was dry. Pups spring was very slow. I dug it out and waited. I needed to get all the water I could carry the last mile up because the the camp at the top is dry. I drank some filled the water bottles and let Joesie drink. She waits till I say it is ok She is a very good friend. I climbed the trial in 4.5 hours. I make camp at the junction of 1174 and 1189 on the ridge. Great view. Make camp and rest. I will now go up the ridge to Polar Spring On 1174 then rejoin 1161. On this familiar trail 1161 I will go to Bald Mountain and out the the trail head for pick up. It will be a hard day. I am all ready to go and on the trail about 8:00 am. I like this part even though it is hard. The trail goes up a ridge and in places the trail is 3 feet wide and falls off on both sides for many miles in both directions. Like being in the alps I imagine. I pick up my feet and put one foot in front of the other and the miles go by. This has bee a very good trip. Aside from my feet not much has happened. Quiet. Alone. Time to get better from the rigors of life.